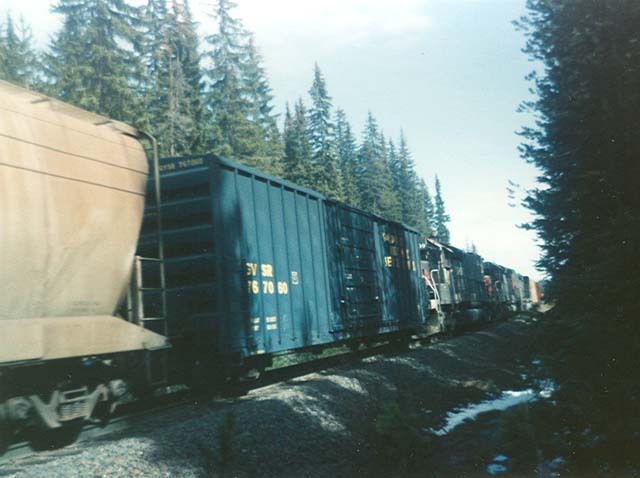 A southbound freight passing through Grass Lake, CA, close to the Oregon border. The Southern Pacific Railroad was one of the largest and most influential railroads in the west. At its high point the mighty SP's system stretched from Portland, OR, to New Orleans, LA, with many branchlines and secondary mainlines covering the country in between. However, SP had only limited influences in Oregon east of the Cascades. SP's presence in the region can be broken down into three main lines- the Cascade mainline, the Modoc Line, and the Lakeview Branch. On 28 June 1861 the "Big Four" - Collis P. Huntington, Leland Stanford, Mark Hopkins, and Charles Crocker- incorporated the Central Pacific Railroad. The United States Government designated the CP to build the western portion of the Transcontinental Railroad. The CP met the westward building Union Pacific at Promontory Summit, Utah, to complete the railroad from coast to coast on 10 May 1869. Even before the Transcontinental Railroad was completed the Big Four were expanding their empire. They started expanding the system both north and south, usually by acquiring existing railroads or by incorporating new railroads. In November 1865 the CP acquired the California & Oregon Railroad, which had plans to build a line from Marysville, CA, north to Portland. The C&O expanded slowly to the north, reaching Roseville in 1869. Construction then picked up, with Redding, CA, reached in 1872. However, construction stopped there. SP's logo as part of a large painting on the diesel fuel tank at Dunsmuir, CA. Jeff Moore photo. Many factors halted construction in Redding, chief amongst them being the affairs of the Oregon railroads the C&O was destined to link up with. In 1868 the Federal government offered land grants and other financial incentives to any railroad in Oregon with plans to build south towards California, with one minor catch...the land grants and incentives would go to the first railroad to complete 20 miles of track. Two railroads, both using the Oregon Central name, started construction on opposite sides of the Willamette River. In 1869 the "east side" line completed the necessary 20 miles, releasing the government aid. A year later northwest transportation magnate Ben Holladay welded the east and west side companies into the Oregon & California Railroad. The O&C built south, reaching Salem in 1870 and Roseburg in 1872. The O&C failed shortly thereafter, leaving the railhead at Roseburg. The Central Pacific ran several surveys, looking for the best route to Oregon from Redding. Their favored route cut along the northwest flank of Mt. Shasta before heading through the low gaps in that part of the Cascade Range into the Klamath Falls area. The line would then go north along the eastern flank of the Cascade Range before re-crossing the mountains via Cascade Pass to reach the southern end of the Willamette Valley in the Eugene area. However, the C&O had an agreement to join up with the O&C to form a through route between California and Oregon, and the O&C took the more direct route south of Eugene. The O&C finally got its affairs sorted out and resumed construction south of Roseburg in 1881, and the C&O resumed construction north from Redding in 1883. The two railroads met in Ashland, OR, on 17 December 1887 to complete the route. By this time the CP controlled the O&C, placing the entire line between California and Oregon under the same banner. At about this same time the Big Four incorporated the Southern Pacific. All affiliated railroads, including the CP, were then leased to the SP. The CP remained on the books as a corporation, but the public image changed over to the new Southern Pacific. The railroad was finished, but the completed route left a lot to be desired. The route- known as the Siskiyou Line, after the mountain range the line passed through on the California-Oregon border, was unsuitable for serious mainline railroading due to many sharp curves, numerous stiff grades, and many tunnels. Still, it was a railroad that was better than the alternatives available before its completion. However, the SP planned to one day bypass the original mainline with the more level route on the east side of the Cascades, but the company never had the capital- or the willingness to spend the capital it had- on such a major line relocation. The situation changed when the Edward Henry Harriman-controlled Union Pacific purchased a controlling interest in the SP in 1901. Harriman brought to the SP the cash to build the long planned bypass, and in the early months of 1905 he set out to make it happen. For complete details of what got built where, please see the Harriman's Cross-State Railroad page of this website. 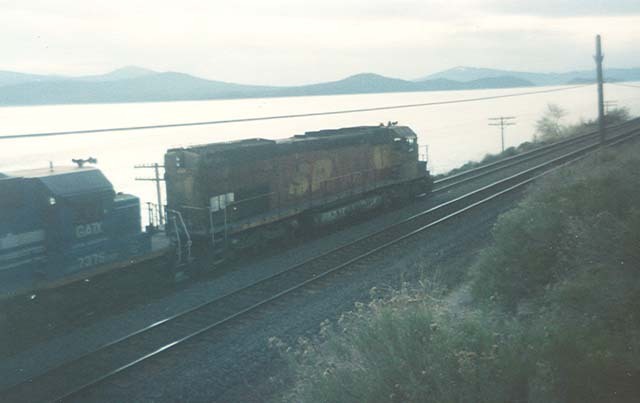 A northbound Southern Pacific freight running along the shores of Klamath Lake not far north of Klamath Falls, OR. The lead unit is wearing the paint scheme intended for the ill-fated attempted merger between the SP and Atchison, Topeka & Santa Fe railroads in the early 1980's. The failure of Harriman's Cross-State Railroad stopped the line north from Klamath Falls at Kirk and the line east from the Eugene at Oakridge. Union Pacific sold its stake in the SP in early 1913, officially divorcing the two companies. However, the U.S. Government was not quite done with their anti-trust efforts in the west. On 11 February 1914 the U.S. Attorney General filed a lawsuit against Southern Pacific seeking to force SP to sell the Central Pacific. All construction efforts halted while SP fought the latest legal action brought by the government. The litigation wound its way through the courts for the next nine years. On 6 February 1923 the Interstate Commerce Commission (ICC) finally ruled that keeping the Central Pacific in the Southern Pacific empire was in the public interest, and the efforts to split the two companies failed. SP immediately put crews back to work. A 118-mile gap lay between the end of the two railroads at Oakridge and Kirk, and filling that gap consumed most of the next 3 years. The final stretch linking the two lines together went into service on 1 September 1926. SP finally had its line on the east side of the Cascades. The new line immediately became SP's primary route between California and Oregon, leaving the original mainline through the Siskiyous as a branchline. Union Pacific purchased the Southern Pacific on 11 September 1996, ending the long and colorful history of the railroad. UP diverted some of the traffic handled by this line to other routings after the takeover, but the Cascade line remains an important part of UP's system today. Mid-train helpers boosting a northbound freight towards Cascade Summit in the early 1990's. Proposals to build a line connecting Oregon with Central Pacific's original transcontinental mainline somewhere in Nevada had been around since at least the 1860's, but little ever came of any of them. Southern Pacific recognized the need for such a line to expedite the movement of eastward moving traffic originating in Oregon after the completion of the original north-south mainline through the Siskiyou Mountains in 1887. Eastbound traffic from Oregon had to first move over the tortuous mountain railroad that was the Siskiyou line to get into California. The traffic then had to move halfway down California to get to the transcontinental mainline, which then had to go back up and over the Sierras through Donner Summit before continuing on east to the Union Pacific interchange at Ogden, UT, for shipment further east. This routing consumed several days and involved lifting each carload many thousands of feet in elevation, which lead to high operating costs incurred by the railroad. Clearly something had to be done. The first concrete proposal to get partially completed was Harriman's Cross-State Railroad, which, if it had been completed, would have seen eastward moving traffic from Oregon transported on a mostly flat railroad over the combined UP-SP system, with the mountain grades reduced down to the one relatively easy passage through Cascade Summit. However, the break up of the UP-SP system by the U.S. Government before this line was completed ended that possibility. As the breakup of the Harriman system became more and more likely, SP started to lay plans for a line of its own that would run from the Cascade mainline at or near Klamath Falls southeastern to a junction with the Transcontinental mainline in western or central Nevada. In 1912 the company took the first definative steps towards building such a line when it started construction of its Fernley & Lassen Railroad. SP built the F&L to reach the giant new Red River Lumber Company sawmill, then under construction in the town of Westwood, CA. The F&L started at a junction with the transcontinental mainline at Fernley, NV, and ran north along the western shores of Pyramid Lake. The line then turned west, passing into California and then along the north shore of Honey Lake to Susanville. From Susanville the railroad headed more or less due west to a point known as Westwood Junction, where the line turned southwest to Westwood. The vast majority of the F&L lay along the proposed line of SP's planned railroad, and as such the company built the Fernley to Westwood Junction segment to mainline standards. 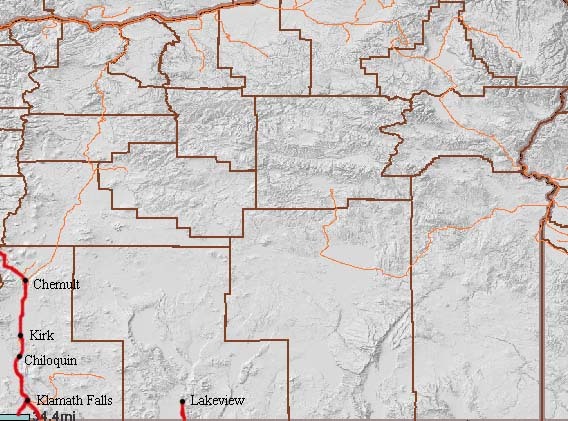 SP intended to connect Klamath Falls and Westwood Junction, but the litigation attempting to force the SP to sell off the Central Pacific prevented any new construction from taking place. The end of the litigation in 1923 finally allowed SP to resume investing in its properties, and completion of the long planned shortcut became a top priority. SP had a powerful new incentive in the form of the Ogden Gateway agreement, which stipulated that SP would turn a substantial portion of its Oregon lumber traffic over to the UP at Ogden, UT. The need for the shortcut was great, and SP started evaluating its various options. By this point the Oregon California & Eastern had been completed to Sprague River, OR, and the Nevada-California-Oregon had been completed to Lakeview, OR. The N-C-O crossed the F&L at Wendel, CA. The SP could complete the shortcut by using the F&L from Fernley to Wendel, the N-C-O from Wendel to Lakeview, and the OC&E from Klamath Falls to Sprague River, with a line from Sprague River to Lakeview being the only new construction needed. SP purchased the N-C-O but was thwarted on the OC&E when the Interstate Commerce Commission stipulated that one-half of that road be sold to the Great Northern. SP then set out to bridge the gap another way. In June 1927 SP broke ground at Klamath Falls on their new subsidiary, the Modoc Northern Railroad. The Modoc Northern was to run from Klamath Falls southeast to a junction with the N-C-O at Alturas. SP drove the final spike completing the new line at Hackamore on 14 September 1929. The new line shaved 210 miles, 24,508 degrees of curvature, and 5,168 feet of elevation gain off the movement on eastbound traffic as compared to the original routing through California and across Donner summit. The finished line eventually became known as the Modoc Line. Traffic remained light until the onset of World War 2, when heavy lumber demand caused traffic to skyrocket. Lumber shipments over the Modoc line remained healthy through the next several decades, but went into a steep decline starting in the mid-1960's. In 1963 SP obtained trackage rights on the Western Pacific Railroad mainline from Flanigan to Weso (near Winnemucca), NV, a move which allowed for the abandonment of the line from Flanigan to Fernley. The end of the Ogden Gateway agreement in 1966 allowed SP to start diverting lumber traffic away from the transcontinental mainline, with much of the traffic taking the much longer route on the SP main down the length of California before turning east and running as far as Texas or Louisiana on SP rails, a longer move that provided SP with much more revenue than the relatively short haul to Ogden. Traffic declined to the point that by the early 1980's barely a train a day each way continued to operate over the line. The Modoc Line, despite its advantages as a route to the east, was still a tough and expensive piece of railroad to operate and maintain. On 23 January 1987 SP closed the Modoc line as a through route. However, the closure would last for only a year, as in 1988 the Denver & Rio Grande Western Railroad purchased the SP. The D&RGW management made improving service to Oregon lumber shippers a top goal of the newly created Southern Pacific Lines, and part of that program was the immediate reactivation of the Modoc line as a through route. However, the anticipated traffic failed to materialize, and by the time that Union Pacific purchased the SP in late 1996 only one train a day continued to use the line. UP considered its options with the Modoc line for a few months, eventually choosing to close the line again at the end of June 1997. The line lay in wait for the next several years. Eventually UP elected to scrap the middle portion of the line, from a point south of Alturas to Wendel. A salvage firm removed the rails on this stretch in 2003. 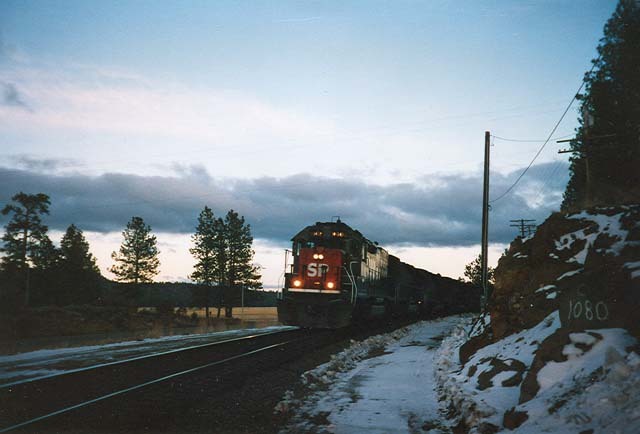 UP continued to operate a weekly freight from Klamath Falls to Alturas to maintain the interchange with the Lake County Railroad until 1 November 2005, when UP leased the trackage to the new Modoc Northern Railroad. The Modoc Northern survived until May 2009, when UP terminated its lease and resumed operating the line for themselves. In December 2009 UP leased the portion of the line between Alturas and Perez to the Lake Railroad, the new operator of the old Lake County. In the spring of 2010 UP runs one train a week from Klamath Falls to Perez to maintain interchange with the Lake Railroad. The history of the construction of the line into Lakeview is covered on the Nevada-California-Oregon page of this website. SP gained access to Lakeview on 26 October 1925 when it completed the purchase of the Nevada-California-Oregon railroad. The line from Alturas north to Lakeview remained narrow guage until May 1928, when SP finally finished the job of converting the tracks to standard guage. Livestock was the biggest single commodity shipped over the Lakeview branch through the 1930's, when that traffic started shifting to trucks. However, as livestock fell off Lakeview became a major lumber town, with no less than seven sawmills and remanufacturing plants operating in the town by 1940. An additional sawmill operated at Willow Ranch. Southern Pacific served the branch with two locals based out of Alturas that worked the branch on an up one day and back the next schedule, with the two trains meeting at Willow Ranch. SP later based one of the locals out of Lakeview, with the two operating as turns out to a meeting point at Willow Ranch and return to their home bases. Carloadings handled over the branch dropped as the sawmills started closing in the early 1950's. SP responded to the decline in business by dropping one of the two local jobs working the branch, leaving one local based out of Alturas that worked the line six days a week. This pattern held true until the early 1980's, when service dropped to twice weekly, with the crew and power for the local making a three day round trip from Klamath Falls to serve the branch. By this point only three sawmills and two moulding plants remained active in Lakeview, and in 1983 they shipped less than 1,500 loads over the branch. SP concluded that the situation was hopeless, and in 1984 the company announced plans to abandon the line. Civic leaders in Lakeview started evaluating various options to save the line, with little forward progress. SP filed a petition to abandon the line in March 1985, and the Interstate Commerce Commission approved the abandonment in August of that year. However, by this point Lake County had things almost worked out, and SP agreed to continue operating the line until a deal could be made. Shortly thereafter Lake County worked out the last of its details and signed an agreement to purchase the branch from SP for $550,000. SP ran its last train to Lakeview on 17 January 1986. The story of this line is continued on the Lake County Railroad page of this website. "Stations West, The Story of the Oregon Railways", Edwin D. Culp, Caxton Printers, 1972. "The Southern Pacific in Oregon", Ed Austin and Tom Dill, Pacific Fast Mail, 1987. "The Modoc, Southern Pacific's Back Door to Oregon", Jack Bowden and Tom Dill, Oso Publishing Co., 2002. "Southern Pacific: a Chronology" by Michael W. Blaszaj, November 1996 Pacific RailNews; pgs 24-31. "Cascade Crossing, The most mountainous mountain railroad in the West?" by Daniel J. Sheets, August 1995 Pacific RailNews, pgs 44-53. "Not only a railroad, but an empire- How SP went from mighty octopus to tarnished suitor" by Don L. Hofsommer, March 1998 Trains, pgs 38-45. "SP's Modoc Line- Tunnel Motors, Two-by-Fours, and Sagebrush" by Greg Brown, July 1992 Pacific RailNews, pgs 24-33. "The Lakeview Branch- The Espee's most obscure piece of railroad?" by David C. Lustig, January 1986 Railfan & Railroad, pgs 52-56. "Tough Times in Timber Country" by Greg Brown, November 1990 Pacific RailNews, pgs 24-34.